Quick Take: Arrested Development, "Flight of the Phoenix"
Review: Arrested Development, "Flight of the Phoenix"
(S0401) "The Great Dark Period." For many, that time has passed; the seven indefinite years that Arrested Development was off the air. For others, it could very well be the present; the days/weeks/months to be spent enduring people like me who aren't wont to shut up about it. But for the Bluths, it's a little bit of both. Clocking in at over seven hours, Season Four of Arrested Development lives up to its name, but not its namesake. Which is to say, it doesn't stagnate. Probably the biggest concern making its rounds prior to this weekend was that the new episodes would be "stuck on 2003," an extension of the show's first run riddled with call-backs to jokes that we all have memorized. Rather, the show develops: in plot, complexity, and of course its list of running gags. Due in-part to this progression, and the busy schedules of the show's cast during filming, each episode is dedicated to a particular character's "arrested development," and how they spent their time during the GDP. "Flight of the Phoenix" is the first of several episodes following Michael (Jason Bateman) and his attempts not to keep his family together, but to emancipate himself from their failures. After finding out that his parents spent all the Bluth Company money afforded by a stimulus package, Michael takes it upon himself to sell his own shares, giving up his presidency and the family's majority control of the company to Lucille "2" Austero (Liza Minnelli). 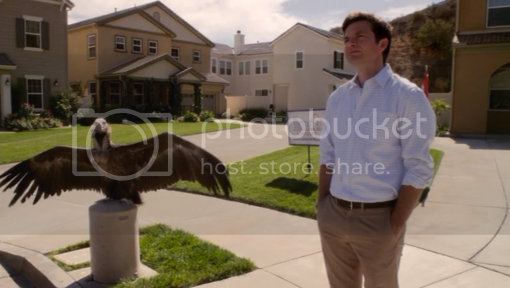 The Michael B Company is born, and its owner/CEO/only employee finishes building Sudden Valley, the arrested housing development at the epicentre of action throughout the first three seasons. Michael's personal success is otherwise unsuccessful as a business venture, however. Much like the show itself, Michael built an entire community, but the city (Fox) couldn't be bothered to build a road. As the Great Dark Period sets in, Michael is driven by debt and loneliness to impose himself in his son's life. At this point, George Michael (Michael Cera) is a university senior, determined to have his privacy. Software. He's determined to have his privacy software hit the market. So Michael joins George Michael in his dorm room, even enrolling in the online University of Phoenix to finally finish school. As he explains to the Workaholics at the airport where he doesn't plan to fly out of, Michael plans and ultimately miscalculates a four-person vote to evict one of the three people living in the dorm. He offers to vote for himself so that George Michael and Maebe (Alia Shawkat) can successfully blindside P-Hound -- the legitimate roommate -- and winds up with a unanimous vote against himself. Only Arrested Development could get me to do a Big Brother review again. This unexpected (re)introduction establishes the Bluth tradition -- of which there are many -- that celebrates Cinco de Cuatro, a festival meant to take back Cinco de Mayo from the Mexicans by celebrating it a day early. The events at Cinco de Cuatro are visited and revisited over the course of the season, always teasing and unravelling the bigger story. With enough overlap later on but not enough context yet, I think it's safe to leave those events to some of the other fourteen episodes. Moreover, Michael finally arrives in Phoenix after threatening to do so for three seasons. He lands, only to be burned by the sun following the foray on his self-esteem that was being burned by his son. This is not an album of the show's greatest hits: it's a sequel. While each episode certainly has its own merits, it's the dynamic of the full season that really ties things together, illustrating why Arrested Development was revived in the first place. It took nearly a decade for audiences to decipher the subtlest of clues planted throughout its original run; there isn't a doubt in my mind that Season Four will age just as gracefully.